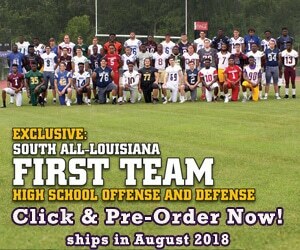 January 19, 2012 – The 2012 Louisiana Football Magazine Heart of Champions is a team compiled from watching every team play in Louisiana this past year either on film or in person, and these are kids who I thought were not DIV 1, but had a huge heart, and played the game all out for 60 minutes. Some of these kids might pick up a Scholarship at another position or go to a smaller school. I loved watching these kids play the position the last two years or four years for some. I took thousands of hours of film from this past year and prior years, and I marked the kids who I thought weren’t necessarily D1, but had big hearts and were great leaders for their team. This is the most thorough list you’re going to find from a statewide perspective. This list has nothing to do with stats or all-state/all-district. These are the players who I thought should make the list. A lot of these kids will play college ball, but it will probably be at 1AA, D2, or D3 schools. They all deserve the chance to play college football. This list is only for the current 2012 graduating class.